My favorite tech gadget at the moment has to be my eBike! It makes more financial sense for me than a car, and gets me all over the city on electricity alone. I would recommend Amazon Fire Stick to anyone who doesn’t want to pay outrageous cable bills. Born in Phoenix and raised in Colorado, Quinn has always had a passion for technology and sports, both of which consumed his childhood. He stumbled into coding while attending Metropolitan State University and quickly realized he had a knack for it, which led him to enroll in an immersive program with General Assembly. A natural leader and life-long learner, Quinn joined the Rounded Digital team eager to dive into a fast-paced environment. Being task-oriented, and multi-disciplined, Quinn brings a systematic approach to developing your industry standard website. 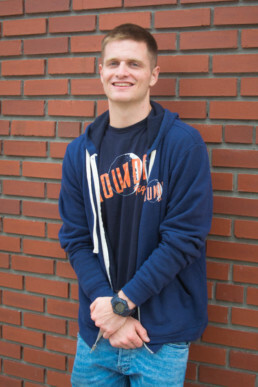 When he isn’t elbow deep in improving the user experience online, Quinn leads an active lifestyle and enjoys riding his bike and shooting hoops.